Best assembly ever -- wild animals. We get a fox, opossum, porcupine, a red tailed hawk and great horned owl. A porcupine! How ya gonna beat that? At the end of the day. the school secretary says that there was a baby opossum outside her house once and her husband called the SPCA and they came and picked it up. I figure it might have been the one we saw today and probably grown-up opossums warn their offspring that "if you are bad and don't listen to us, you'll wind up spending your whole life going to assemblies of school children." You get the sense that Tom Gallagher sometimes wonders whether he did something heinous in a former life that earned him a more than a decade wrangling obnoxious middle schoolers whose teachers have taken a day off. 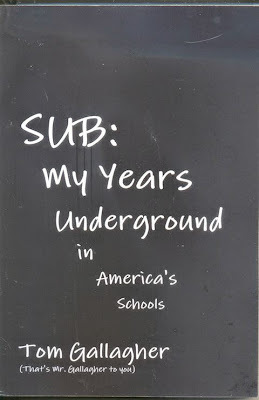 Sub: My Years Underground in America's Schools is a sort of enhanced diary of those encounters and a fascinating window on what really goes on in public schoolrooms in the San Francisco Bay Area. It is a delight. I laughed out loud often. Meanwhile, almost insensibly, Gallagher's deeper concerns show through: these schools, despite most people's best intentions, are failing too many young African Americans. And closer you come to that reality, the less easy it is to imagine easy improvements. On my second day on this job, let's get serious here for a moment. Third period has seven black kids out of a class of thirty and I have to jump start four of them. One has no book because he forgot it. I give him a hall pass to go get it from his locker, but he comes back saying it wasn't there. Another is spending his time cleaning his binder; two girls are drawing. None of this is antagonistic today, as it was with the kids I kicked out yesterday, but these are the only kids that I have to push. This is a sort of situation that is repeated all over the place and it's the kind of thing that almost no one knows how to talk about, so they don't. For instance, I haven't even really discussed it thus far. I usually don't even keep notes about how many of the kids I throw out are white and how many are black. 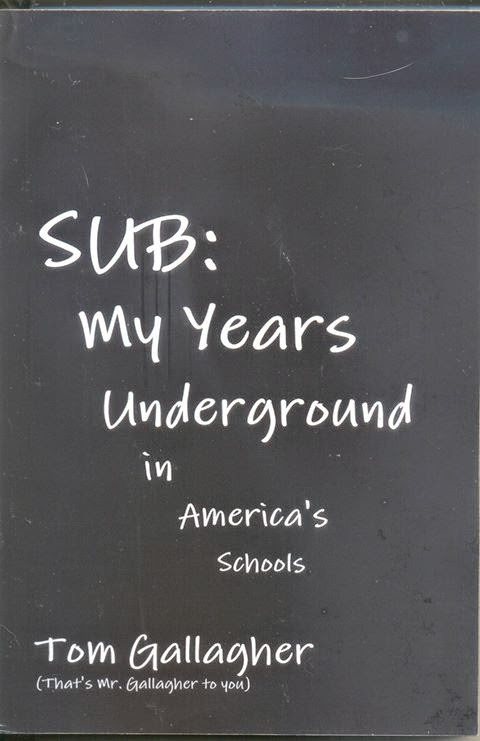 But if I really get to talking to someone about what being in the schools is like, I invariably tell them it seriously heightens one's awareness of the plight of black America, a topic to which I shall return frequently. ***In one class a black girl with serious vision problems and special large print books complains about the Chinese kid coming up to another Chinese kid across the table from her and asking questions "in their stupid language." "At least we speak another language," the kid says. I tell them both to stifle themselves. Does this guy actually thinks he's discriminated against because he's black, or does he just say it because it gets a reaction? Actually, although I think he's wrong, I don't know that his analysis -- if it really is that -- is any more wrong than most of what goes around on the topic these days. Certainly there are people who think he won't or can't do school work because he's black, although not too many of them will say that publicly these days. And there's others who'll say that his work is poor because his school or his teachers are failing him. And I don't think they're actually on the mark either, to the extent that they think that the primary cause of black students' difficulties lies in unequal treatment or unequal expectations within the educational system. He's not being sent out because he is black, and he's not not doing his work because he's black, and yet insofar as he thinks that his race has everything to do with his relations with the educational system, he's right. ...***And I finish the day in a tranquil island of Algebra Class where a girl who asks me for help is apologetic for asking for the second time. Wow, is that a change! ... Ms. J [the regular teacher] is black, and I really wonder how she feels about the fact that her two best classes -- the Algebra classes -- have not a single black student in them, but I'm sure I'll never speak with her about it. At least I can report a measure of equality on the racial front, though -- the list of students I have ejected from class [throughout the full day] already includes black, white, Asian, and Latino. And so the beat goes on. The kids think Gallagher looks like Jack Nicholson; some like him a little, some don't. He "yells at children professionally." He is willing to suggest that maybe African Americans having arrived in this country involuntarily as slaves has something to do with the black kids' troubles -- but he is not on some doctrinaire riff. He's just busy trying to cope. Can the adults learn to talk with each other more honestly about race and education? Gallagher offers plenty to chew on, entertainingly. It's all a Democratic plot! Time to build some arks?